With great power comes great responsibility. With Unlimited Power, then, comes a whole bunch of new options for your Star Wars RPG character as well as new items for your GM to use in the game. Yes, the latest book is now available. As one would imagine, it revolves around the Force, the mystic... well... force in the Star Wars universe that lets people do fantastic feats. 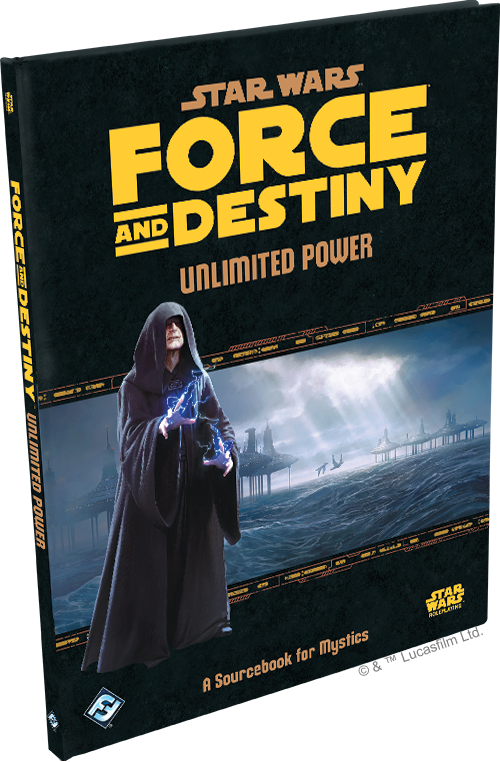 Unlimited Power, an all-new sourcebook focused on the Mystic career path in the Star Wars™: Force and Destiny roleplaying game, is available now at your local hobby retailer or in the Fantasy Flight Games online store here! The Star Wars galaxy is as much a realm of magic and mysticism as it is science and technology, and the Mystic career path has allowed players the opportunity to explore less traditional ways of communing with the Force. Unlimited Power opens up three new specializations, doubling the number of options available to Mystics in your campaign. More than just a supplement for Mystic characters, Unlimited Power adds three new species to your Force and Destiny campaigns as well as new Force powers, gear, vehicles, and adventure possibilities. Unlimited Power also details the precarious path to the dark side, should a player's morality fail and he or she succumb to the temptation of power—at the cost of all else.